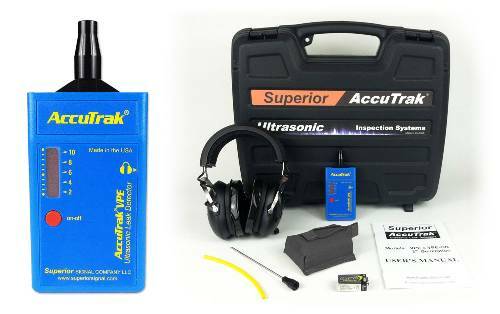 The AccuTrak® VPE Professional Kit is designed for technicians who work in noisy places, or who regularly need to find smaller leaks. The VPE Professional Kit includes all the great features of our VPE Standard Kit upgraded with professional Noise Cancelling Headphones, a convenient Belt Pack, and a larger case to keep everything together. These high quality headphones eliminate all background noise, allowing a technician to effectively find the smallest leaks – even in very loud environments. You can choose the standard style professional headphones, or the hardhat compatible version – same price!